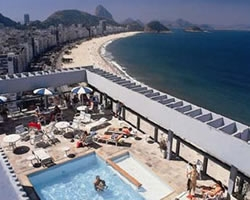 The legendary Rio Othon Palace puts you at the center of the chic Copacabana beach in the very heart of Rio. One of the most beautiful and famous beaches in the world, if you're going to do Rio, do it like this! With a private heated swimming pool, and fitness club with sauna and massages, it's among the most luxurious hotels in the area. At night, Royal Holiday members admire breathtaking views of Rio and it all goes on until the wee hours. A privileged location puts you at the very center of the action with easy access to Sugar Loaf Mountain, the Botanical Garden, the Museum of Modern Art and the Municipal Theater.